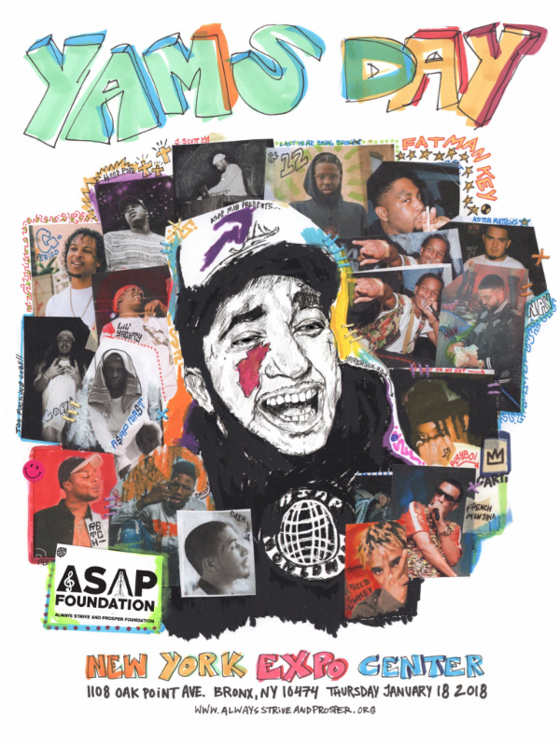 The third annual Yams Day concert — an event aimed at celebrating the life and work of the late A$AP Mob founder Steven "A$AP Yams" Rodriguez — came to an abrupt end last night (January 18) after a brawl erupted backstage. The event, held at the New York Expo Center in the Bronx, was shut down after 10:30 p.m. EST during an intermission that found A$AP Rocky in the audience partying with the crowd, Billboard reports. As he continued, an A$AP crew member took the mic to alert him to a security issue backstage. The NYPD confirmed to Billboard that the incident was identified as a "crowd control situation," further clarifying in an email that "there was a large crowd leaving the concert. No gunshots, no injuries." Cellphone footage from backstage shows Lil Uzi Vert involved in the scuffle, while some witnesses also initially reported that viral Brooklyn rapper Tekashi 6ix9ine caused the incident. The latter took to Instagram afterwards to say he had nothing to do with the incident. Before the brawl, Nav, Lil Yachty, PNB Rock, Tekashi 6ix9ine and Ski Mask the Slump God performed sets. French Montana, Flatbush Zombies, A$AP Mob were also slated to appear before the evening was cut short. The cause of the brawl has yet to be confirmed. Find footage of the incident below. A$AP Rocky Drops Acid in the Video for "Kids Turned Out Fine"
A$AP Rocky Reveals 'Testing' Artwork, Confirms "ALBUM DONE"
Lil Uzi Vert Returns with New Song "Free Uzi"
Lil Pump and Lil Uzi Vert Team Up for "Multi Millionaire"